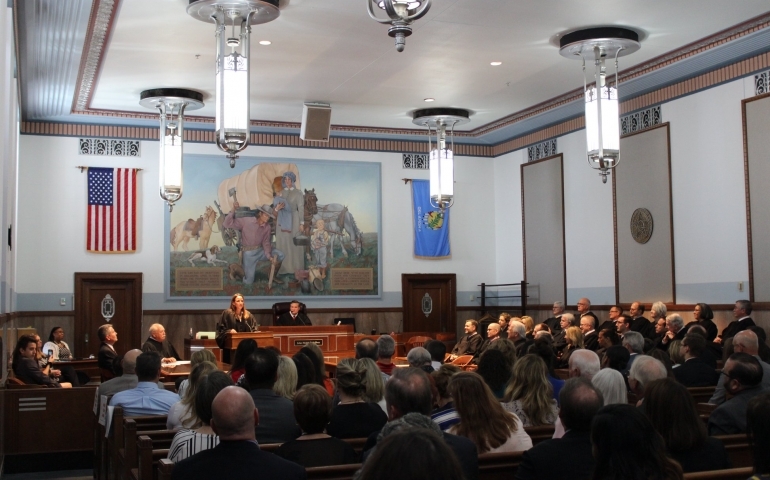 On Monday, May 7th, Southern Nazarene University alum, adjunct professor and faculty advisor for Southern Nazarene University’s Law Club, April Collins, was sworn in as a special judge for the 7th Administrative Court for the State of Oklahoma. The ceremony was held at the Oklahoma County Courthouse and was attended by public officials, legal colleagues, former students, friends and family. After being sworn in, the Honorable Judge Collins shared her thanks of various people in the room and how thankful she was for this opportunity. Judge Collins attended Southern Nazarene University (SNU) because of the school’s connection to the Church of the Nazarene, the university’s Pre-Law program, and a call from Dr. Loren Gresham, who was then faculty, encouraging Judge Collins to take advantage of an internship program in Washington D.C. Since graduation from SNU, attending law school, and beginning a legal career, Judge Collins has remained involved at SNU both as a professor and as an advisor of the university’s law club, which she helped Chris Cummings found. Judge Collins went on to stress the importance in being able to articulate thoughts in writing with proper grammar, saying, “Today’s generation is exposed to writing that has not been edited.” She claimed that there is a large amount of writing that has not been properly edited, so it is important to learn how to write well. Additionally, Collins suggested both taking advantage of a study abroad or internship program as well as joining SNU’s O.I.L. program. Judge Collins said that O.I.L. (Oklahoma Intercollegiate Legislature) helped her to create connections to people entering the law field early on. Judge Collins has been an influential mentor for students at SNU and will continue to be a model alum as she begins her new career.